As a little girl, I loved playing with dolls. I would spend hours pushing them around my street in their pram with my friends. Pretending we were 'mammies' was one of our favourite games and I remember spending many a summer's day in my front garden with a washing up bowl and fairy liquid which would be my version of 'giving my baby a bath' before moving on to washing all of my dolls' favourite outfits and hanging them on my mam's clothes horse to dry in the sun. Ah a life before iPads, apps and computers - life was certainly simpler then. I really want to give my children the same sort of childhood memories that I had - spending long summers out with their friends, inventing games and staying out until dark. I think as much as children love to be 'plugged in', they still very much enjoy playing with traditional toys too. I know that some people have a perception that children these days spend all day long playing Minecraft or watching YouTube videos (my mam is one of these people) and I will admit that my three do play on iPads, probably most days. But it's no longer their favourite thing to do. I kind of feel like the novelty has worn off a little. Jack and Heidi spent the whole of last weekend playing outside with their friends (through choice) and Harry spent the weekend at his friend's house. My three all have televisions in their bedrooms and have since a young age but just because they are there doesn't mean they watch TV 24/7. All three will spend hours playing LEGO and we currently have a bucket between their rooms on our landing which I can hear them sneaking into at night. I didn't have the luxury of a television in my bedroom until I was 10 years old and I'm pretty sure our first home computer was when I was 12 or 13. Times do change though and as our children ar growing up in a world surrounded by technology, I do think it's important they are brought up using it too. But I don't want this to get in the way of the traditional childhood I want for my kids either. It is easier to encourage my children to use their imagination a little more now they are older I think- they can play outside in our street without supervision and Harry and Heidi can be trusted to go to the park at the end of our street. They love having this freedom and as the sunshine continues I know they'll be spending more time carrying boxes of toys onto our lawn and playing with their friends. Just as I did when I was a little girl. Toys have changed now though and although Heidi would be happy washing her dolls in a kitchen bowl like I did, her eyes can't help but widen when she spots a new dolls accessory to try. 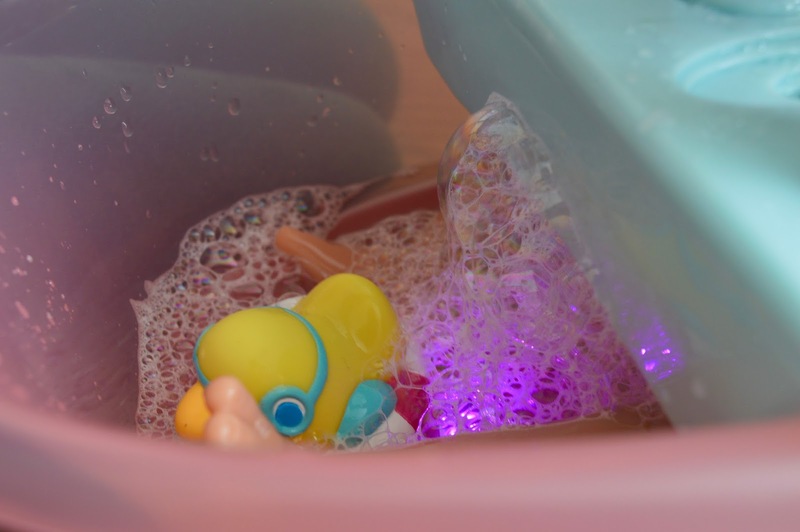 It's Heidi's birthday soon and the lovely people from BABY Born sent Heidi their new BABY Born Interactive Bath with Foam as an early birthday gift. 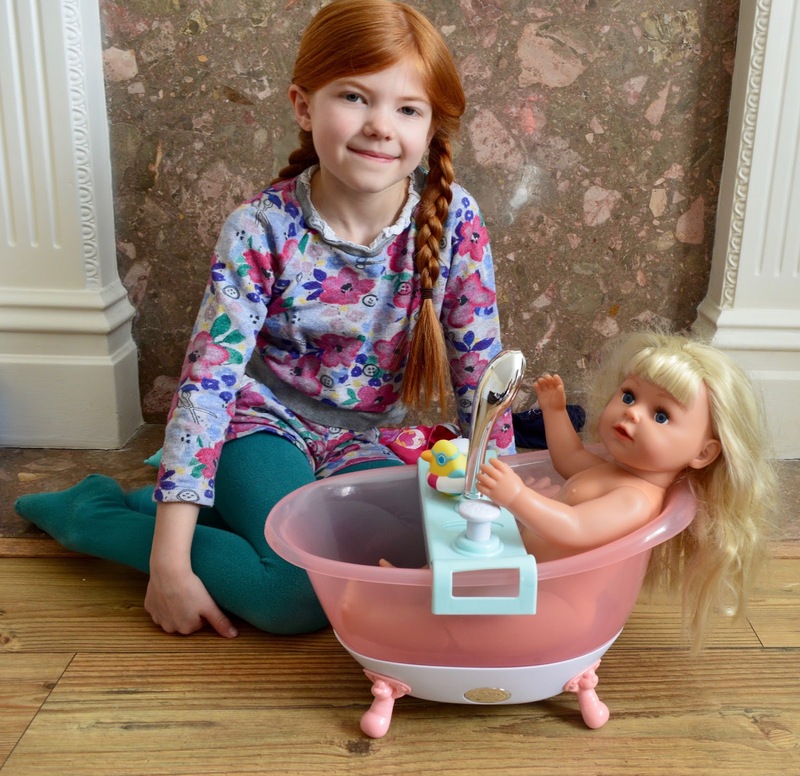 I have to say, Heidi LOVES it and if your child enjoys playing with dolls, this bath makes a lovely birthday present. Press another button for music and lights - something Heidi wishes she had in her own bath! There are hardly any negatives we could think of if I'm honest. We used Heidi's BABY Born Sister doll but the bath will fit most dolls. Heidi did mention that there should be a bath extension with a bottle of bubble bath but I'm not sure this is needed - especially as so many children suffer from allergies. I think sticking to a bubble bath you know your child is ok with works best. I would have liked to have seen a baby bath towel included with the kit so it was a complete bathing experience but it wasn't too much of an issue that one wasn't included - Heidi just used one of our hand towels. So in answer to my original question - yes, children still very much want to play with toys. You may have an image of today's kids sitting in their bedrooms with their headphones in and being glued to their iPads 24/7 and yes, this is sometimes the case but I promise that around 80% of the time it's not. 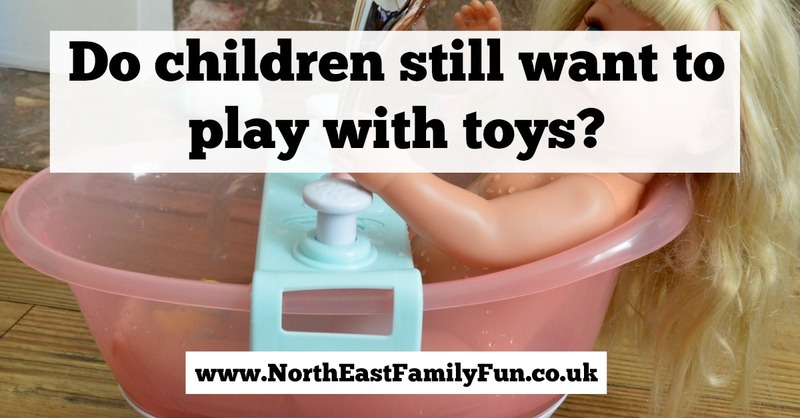 They still very much enjoy playing with traditional toys with dolls, action figures, LEGO, Dr Who figures and cardboard boxes being very much an everyday staple in our house. Heidi and Jack loved spending the weekend playing 'mams and dads' and our BABY Born doll was very well looked after - she was washed, dried, fed and taken for numerous walks and introduced to other children in our street. It was lovely to see and now the weather's getting nicer, I can't wait for more weekends like this. Let me know if your children still spend a lot of time playing with toys. Ahh! My girl would love this. 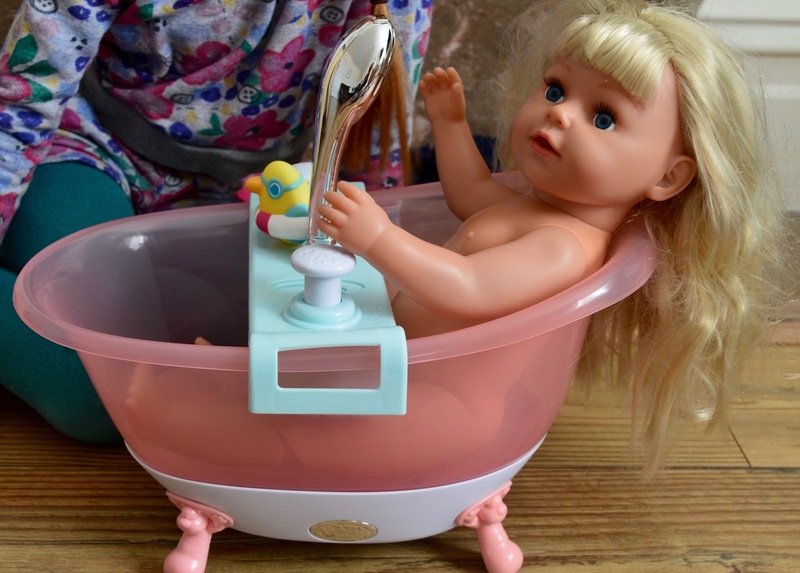 She is always bathing her dolls but just in the sink. It looks like fantastic fun! I think it's something to add to my girls birthday list. That is really cool. I actually can't believe I didn't keep my old baby born when I was a child. Didn't think of it at the time I had to sell the house. Like you, I'm keen to ensure my children have real memories of their childhood - not just the apps they played with! Role play is huge.